There are a plethora of fitness gadgets available for exercise enthusiasts to track their results. One gadget I like using with some of the groups I train are pedometers. 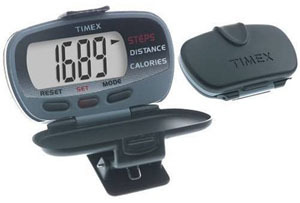 A pedometer is a step counter that records the number of steps you take by the motion at your hips. They come in various models, but you can get a decent one for ~$30. Personally, the feedback from the machine makes you want to increase your daily step count to achieve a proper weight and enhance your cardiovascular system.